Buying probate properties can be complicated for buyers unaware of the variables and legal requirements that can be involved. The process could be straightforward, similar to a standard sale, but most have at least one quirk. Here are some potential differences buyers should consider. Understand the sales process up front. There is no set procedure for conducting probate property sales. Sometimes the executor has complete authority to conduct the sale without approval from the probate court, sometimes the process requires that all the beneficiaries (persons inheriting the estate) have to approve the selected offer. If the listing broker doesn’t provide a detailed description of how the sale will be conducted – ask. Understand the sales process can change mid-stream. The sales process, even if set in stone at the beginning of probate, can change at any time. For example, an estate is selling a home and the executor has complete authority to conduct the sale. One day, a beneficiary expresses concern regarding how the executor is conducting the sale. The beneficiary asks the probate judge to change the executor’s authority so that court confirmation is required to close the sale. The judge agrees. Now all offers must be reviewed by the executor AND all the estate’s beneficiaries and the accepted offer must be approved (“confirmed”) by the court. Probate Properties Are Not Sold In Off-Market Sales. Unless the deceased person’s will directs otherwise, executors are obligated to place the property on the open market and obtain the best price possible. Executors are often bombarded with pre-sale, low ball bids from buyers hoping to have their offer accepted before competing buyers see the property on the MLS. Executors typically ignore such offers and ask that all buyers wait to submit bids until after the property is placed on the open market. Probate Properties Are Not Sold At A Discount. A formal appraisal is conducted at the beginning of probate as the entire estate is valued for tax purposes, so the executor has a good idea of the property’s current market value. The executor has a legal obligation to sell for no less than market value. However, there can be exceptions. If a property has been on the market a long time without receiving offers, the executor might drop the asking price to stimulate bid activity. Probate Properties Are Sold As-Is. Executors and trustees are obligated to disclose everything they know about the property being sold, but sometimes that isn’t very much. They are exempt from providing some disclosure documents required in standard home sales because it is assumed the executor may not have lived in the home. In some instances, the executor may not have ever seen the property. All probate sales are considered “as-is” and buyers should conduct all usual inspections. Probate Sales Require Patience. If the executor has sole authority to close the sale, time frames for reviewing an offer, conducting inspections and closing escrow are the same as a standard sale. If beneficiary approval or court confirmation are required, it can take 30 days to review an offer – longer if any beneficiaries live in another town, state or country. Buying probate properties requires patience and flexibility. Those are just a few important things to look out for when buying probate properties. Every sale is different, so always ask questions. Have a great week! 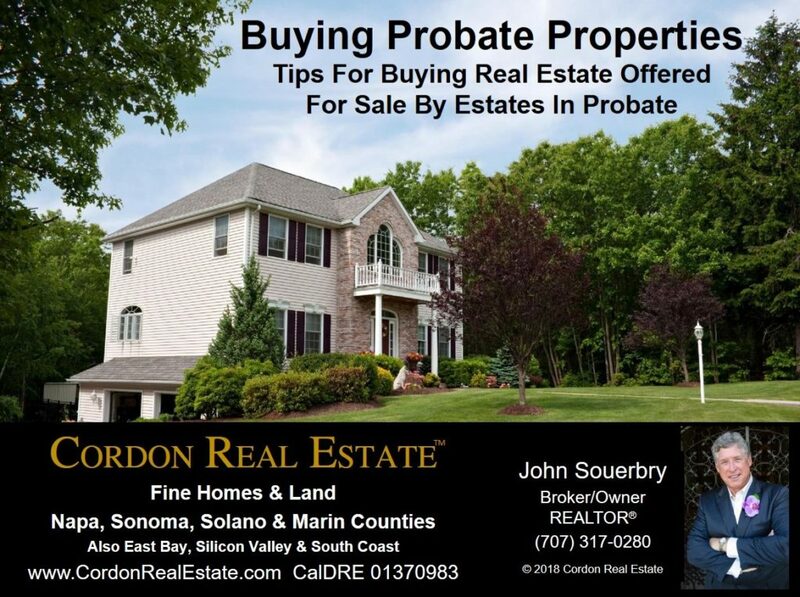 Questions about probate sales or buying and selling real estate in general? Drop me a line.